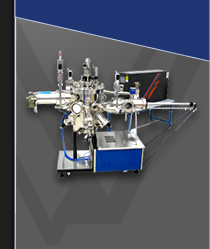 The SVTA In-Situ Cathodoluminescence (CL) System is based on electron excitation of the growing thin film, typically using an existing RHEED electron beam. The stimulated light is collected and spectrally analyzed using only a single 2.75" CCF viewport. The collection optics are mounted on a retractable bellows to avoid coating of the lens assembly during growth. Valuable information on the semiconductor band gap allows quantitative determination of material composition and optical quality. By adjusting the electron energy, depth profiles can be accessed. 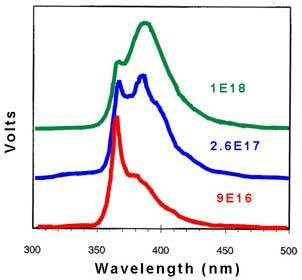 Qualitative information of doping levels can be extracted from the spectra. The In-Situ CL technique provides essential information on thin film growth processes when a RHEED diffraction pattern cannot be observed.